It’s official. Apple just send out press invites for an event on October 22nd where the company is expected to reveal its new lineup of iPads. 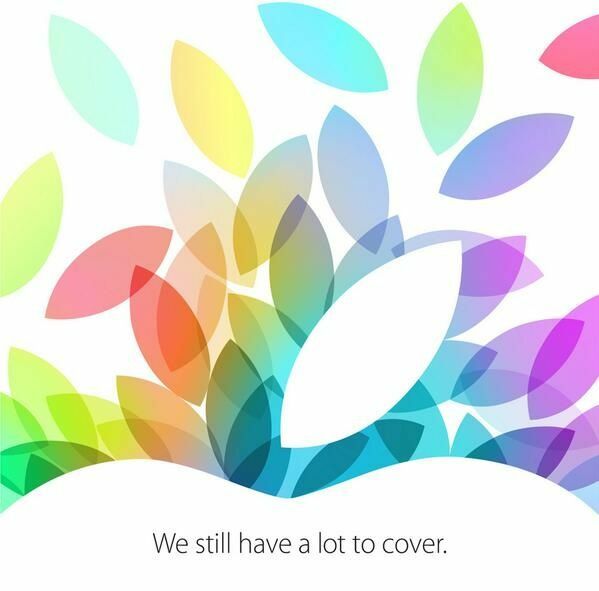 The invite features the top of the Apple logo with the tagline, “we still have a lot to cover,” perhaps hinting that we’ll see a lot more than just iPads. UPDATE: Again, the new iPads will be unveiled on October 30, not the 22nd.. The keynote is set to kickoff at 10AM PT. Expect the unveiling of the fifth-gen iPad with faster internals (including the 64-bit A7 chip from the 5s) and a slimmer design. The second-gen iPad mini is also rumored to come with faster specs and a more lightweight exterior, and depending on who you ask, it will also have a Retina display. If the mini does go Retina, expect supplies to be incredibly constrained throughout the holidays.